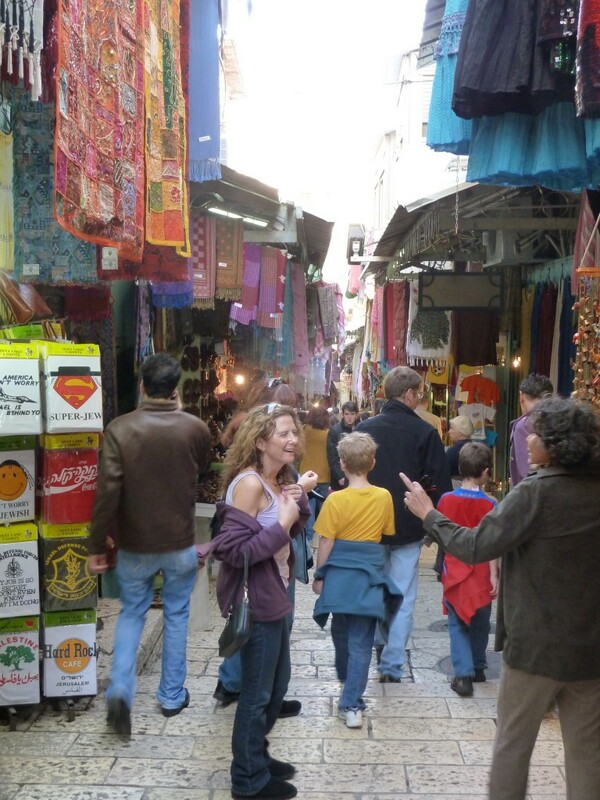 Can you guess what you can buy on the Via Dolorosa? Walking through the Old City of Jerusalem is an assault on the senses. The winding stone streets are deeply crowded. Tiny shops cover every inch of wall-space and hang their wares out into the alleyways. 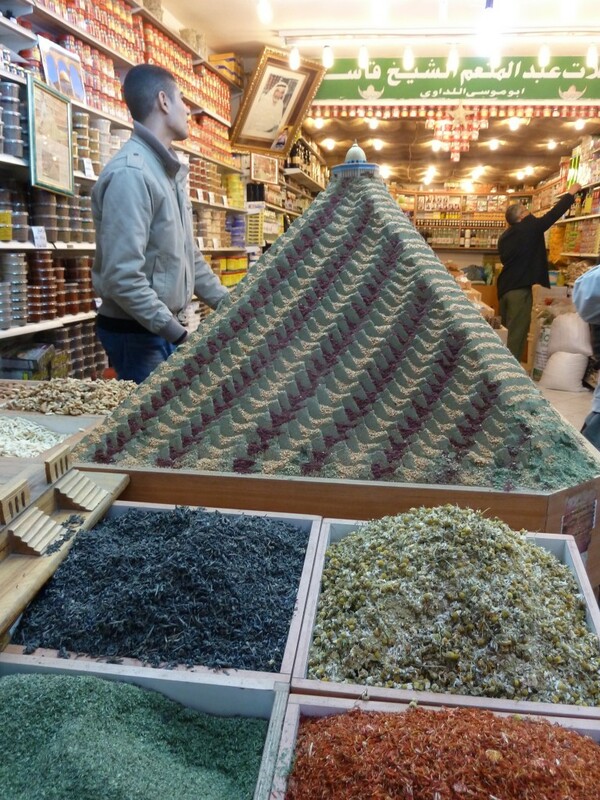 Tourist crucifixes and icons compete for space with lollies, pastries and piles of spices. Clothes and rugs hang everywhere. Butchers shops display carcasses identifiable by the animal’s tail, cut off and then stuck back into the body roughly where it came from. Every now and again there will be a couple of shopkeepers sitting between their shops playing backgammon, oblivious to the passing crowds. We were meandering roughly in the direction of the Arab quarter and the Damascus Gate with Callum fighting back sensory overload by using his fleece as a make-shift gas mask. Our vague aim was to find some food in shops not closed down during the Jewish Shabbat. 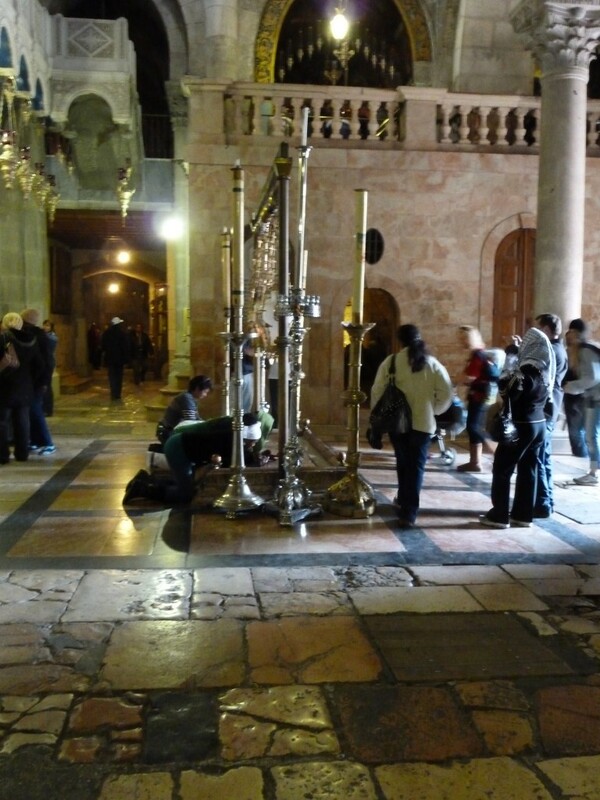 Unthinkingly we stumbled upon the core of Christian Jerusalem – the Church of the Holy Sepulchre. When this Church was being built in the 4th Century they found the tomb of Christ as well as the rock that the crucifix was stuck into to hold it up. 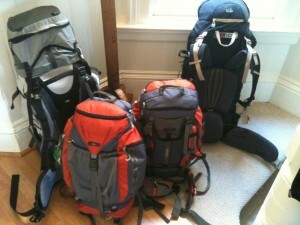 Both can be seen today, and hordes of pilgrims approach them with astonishingly physical fervour. Just inside the door to the Church is a large stone slab on the floor. This is the Stone of Anointing which is supposed to be where Jesus’ body was prepared for burial. It is a startling introduction as people lie kissing it or spreading medals on it. I wonder if it makes any difference at all that the stone was installed in 1810. I have this feeling that if anything is going to imbue an object with power or significance, then 200 years of that sort of veneration is a good racing start. But then 200 years pales into insignificance compared to how long people have been venerating the tomb itself. Again hard facts and Biblical references don’t sit well with the tomb’s story. But do hard facts really matter in the face of that much history and that many people’s belief? I just don’t know. When you stand in the midst of such a beautiful, mystical building redolent with incense and the rolling tones of Greek-orthodox priests at prayer it seems churlish to even consider anything as mundane as archaeological evidence. Including a shop selling a much more modern item reminiscent of the Cross – an X-box.